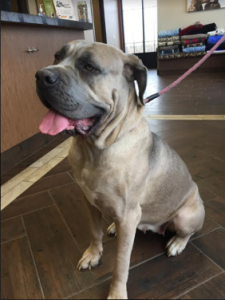 Dutchess is approximately a 2-year-old female spayed Cane Corso mix (rescue) who presented to OAH for right forelimb lameness. The owner reported that Dutchess fell down a flight of stairs a few days prior and was limping on her right leg. She also noted that Dutchess’ right elbow appeared to be swollen. The owner had no other complaints and stated that she was otherwise a healthy, large breed dog. When Dutchess came to Oswego 2 days later, she had a marked swelling around her right elbow joint. Her vital signs and general wellness were otherwise normal. On orthopedic examination, there was mild-moderate crepitus (“crunchiness”) on flexion and extension of both elbow joints. Her left elbow was non-painful, and she was very comfortable on palpation. On palpation of the right elbow, she appeared to be in moderate pain. At this time, it was suspected that Dutchess either had a soft tissue injury of the right elbow joint, a fracture of the right elbow joint, or potential traumatic injury secondary to suspected elbow dysplasia with some degree of arthritis. At this time, we decided that comparative elbow radiographs (x-rays) would be useful to help diagnose our current suspicions of what happened to Dutchess’ elbow. We took an x-ray of the right elbow and noted osteophyte formation (new bone growth) which can be evidence of arthritis. It was also noted that there was a fracture of the anconeal process of the right elbow. We also decided to take x-rays of the left elbow and noted similar radiographic changes. This confirmed our diagnosis of a condition that is found in large breed dogs called bilateral ununited anconeal processes. This is a form of elbow dysplasia and is a condition that causes instability of the elbow joint and develops secondary arthritis. In Dutchess’ case, this most likely was the cause of her injury. Given the arthritic changes in Dutchess’ elbows, we decided the best treatment for her was to do surgery. We successfully removed the fragmented pieces of bone in her elbow joints. Post-operatively she was placed on anti-inflammatory and pain medication with instructions for rest and very limited activity. Her sutures were removed two weeks later, and her incisions healed well. Two months later, Dutchess was seen for a recheck evaluation. It was found that she was walking very comfortably and had no signs of lameness. The range of motion in her elbows was slightly decreased than a normal dog, which was due to the arthritis already present in both elbows. However, the stability of her elbow joints was much greater than before due to the successful surgery.